Yes, since it was the highest HP locomotive with high capacity 16-645F series engines, WITHOUT any exhaust silencer on the turbo exhaust. The "Dash 2" series of units, which came out in 1972, all had exhaust silencers. Yes, being delivered in time for the 100th anniversary of the Gold Spike event (May 10, 1969), the UP numbered them in the 6900 series, and referred to as "Centennials". Immediate notification of all No. 844 and No. 4014 train schedules, tour stops and other excursion-related activities. Exclusive news and updates about the UP Steam program direct from the Cheyenne Roundhouse. Insider-only video access to UP's steam giants from rail-side to the shop floor. You'll also get a special invitation to join the UP Steam Club Facebook Group where fans get in on the action by submitting their own photos, videos and memories of The Big Boy and the Living Legend! Upload your favorite photos and video of No. 844 and No. 4014! Share your steam knowledge via the group discussion area! Participate in live Q&As with members of the UP Steam Team! Is there a fee or anything to join the Steam Club or is it free? Maybe you should try, and then let us all know. Free. They just posted a quick video saying that the boiler is full of water and hydrostatic testing is imminent. 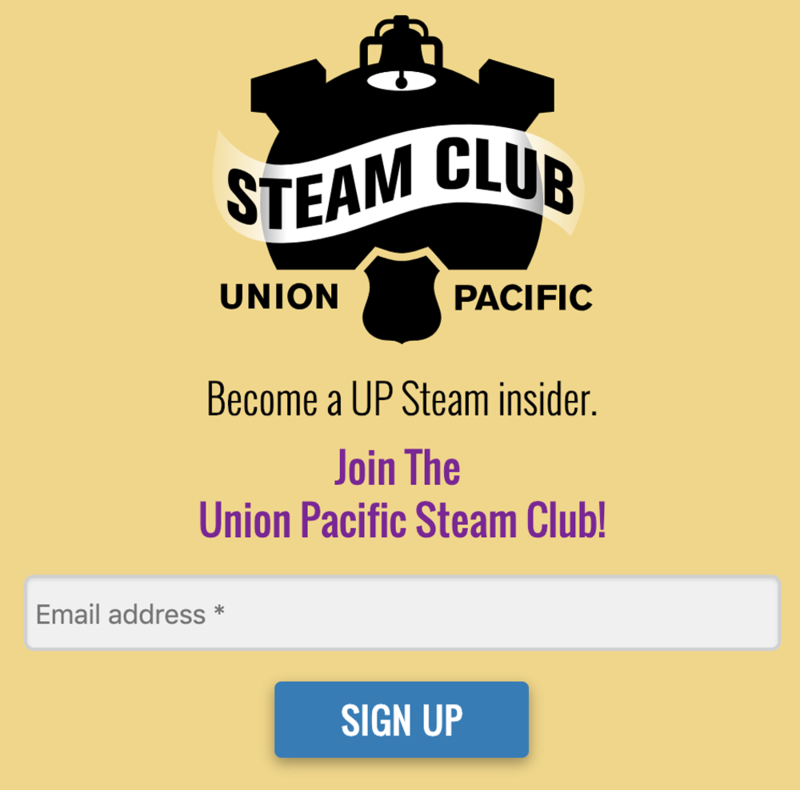 The best things in life are free and so is the Union Pacific Steam Club. "Free"
I have heard that they are now working on 4014's tender instead of the tender from 3985. Is this true? Or just another un-confirmed rumor? The same thing could be said about a lot of mainline steam locomotives including NKP 765 Rich...can't we just be happy we get to witness this? I guess not. I believe the 4014's tender does not have a oil bunker. Originally (and likely still is) the 3985's tender was planned to be used has it has the oil bunker already in place. And no, they are not completely identical. What is different, aside from oil vs. coal? I will go double check my references (mostly Kratville) but they sure look identical to me. What difference does it make? They are identical, and able to be swapped back and forth in a couple of hours. Really? The fact that 4014's tender is still coal, and 3985's tender has already been converted to oil (back in 1989/1990) doesn't mean anything? I thought I read somewhere that all of the oil conversion stuff for 3985 was taken off 3977 in exchange for UP doing a cosmetic restoration on it? I've also heard it speculated that some or all of 3985's oil stuff is being used on 4014.. Correct. Also all of the UP/CNW cab signal & ATC equipment, and 3985's tender. I thought the late 4-8-4, late 4-6-6-4, and 4-8-8-4's were spec'ed by UP and ALCO to use common parts where possible? Guess a tender is a "part"? And were not all three classes coal burners as built from ALCO? Guess they are using the MU box from 3985 also? The UP had/has only one "Diesel MU Box", and simply moved it from 844 to 3985 and back, as needed. This is a review of all the answers: Running on a class one railroad requires more braking to be onboard than the steamer provides and adds dynamic braking as well. Plus electrical power for the passenger cars. Not true, as NONE of the UP diesel electric locomotives have HEP capability. The UP passenger car fleet have their own HEP power cars which supply all the electrical needs of the passenger cars. Plus, the Steam Crew has their own "power car", i.e. the Boiler/Dormitory car "Howard Fogg". Concerning the PTC comment, it would make no difference whether the trailing diesel unit/units are equipped with PTC or not, as the LEAD LOCOMOTIVE must have PTC, i.e. either FEF-3 #844 or #4014, in order for it to be in the lead/controlling position. I didn't know that it did. Please post a photo of #4014 with a diesel pusher. Hi Kelly: There is no photo available at this time. The 4014 is still in the steam shop. The 844 does have photos of a diesel being used. OK then, why would you ask such a question about 4014? Hi Hot Water: because Rich said the following on page one of this thread. “diesel coupled behind does all the work”. Is this true? "the diesel coupled behind does all the work." Maybe they will put a diesel behind it. Maybe they won't. 844 went to Memphis in 2016 without a diesel. Came back with one. Most likely chance is that 4014 goes west hauling about 5 cars, which is the typical UP consist as of late. It's a dog and pony show. Chances of UP ever hooking up enough train behind that thing to make it work are somewhere between slim and none. Best chance was Frontier Days, and now that's gone. A lot of people interested in steam engines like to hear them work, especially the people that crew them. That isn't going to happen here. It will be a great show. It will be fun. It will be cool. It's something a lot of people have never seen, and never thought they would be able to see. It will be nothing like what the engine was designed for and used for in the steam era.....and for some people, hauling 5 cars loafing around, whether there is a diesel or not behind it, is a breaking point, and I totally understand that line of thought. It's the equivalent of seeing a mainline locomotive like 611 run 10mph at Spencer. Been there, done that. It can be fun, and there are friends to see. It's close to home, so it's cheap.....but it's nothing like seeing the engine on the mainline climbing Blue Ridge or Christiansburg Mountain with 20 cars tied to the tender. That is worth the trip every time, whether to ride or chase. Its a very impressive show. That's what Rich is getting at. The intended use isn't enough to get excited over. Maybe I'm wrong. I hope I am, but I'm not holding my breath either. I thought there was talk of them doubleheading 844 and 4014. Has that been ruled out? if they did doublehead would a diesel still be necessary; if nothing else for braking? I thought there was talk of them doubleheading 844 and 4014. Has that been ruled out? if they did doublehead would a diesel still be necessary; if nothing else for braking? A diesel is always welcome for dynamic braking assistance on those long western downgrades. It will be nothing like what the engine was designed for and used for in the steam era.....and for some people, hauling 5 cars loafing around, whether there is a diesel or not behind it, is a breaking point, and I totally understand that line of thought. Then my suggestion is for those people to stay home, so there is more room for the rest of us who appreciate seeing an engineering landmark that we never dreamed would return, rolling past under her own power. Of course that is a pointless request, those people will be out in force, *****ing endlessly about how it is completely unsatisfactory, and if they had been in charge, things would have been completely different and oh so much better. I suspect they will be there anyways. I tend to remember the same remarks for 1218 as well back in the day. The thing was so overpowered that it didn't make much noise on large parts of the system. I never got a chance to see 3985 run, but I suspect similar comments were made. Still, like 4014, it is pretty cool to see something like that running under its own power. Any steam, especially steam on the mainline, is a good thing and not to be taken for granted. Should be a fun time. Too bad there will not be a "steam pull" contest between 4014 and a C&O H8 2-6-6-6! Who is restoring a C&O H-8? I don't get why people have to hate on Union Pacific. They could have just said F you to the big boy and not restored it. Instead, the company spent millions on equipment, parts, and labor to restore the locomotive. Rather than spending only about 25% of that on continuing maintenance and the FRA mandated 15 year inspection on Challenger 3985. Absolutely NOTHING! The current manager wanted #4014, and subsequently stuffed poor 3985 into the last stall of the roundhouse, back in the winter of 2010/2011. Do you think a triple header with 4014, 3985, and 844 is possible? Neither. An N&W y6 would out pull them both.But...that's for another thread. Maybe, but it would be Foamer City if it happened. And the big question: Where can you run a BB locomotive? Length? Weight? 14 wheel tender? North Platte to Ogden, OK? Hopefully they have checked the railroad for more places to run. Withoit any fore seen isdues. No problem, Kelly. You can have my spot. If/when this thing ever runs, I’ll be somewhere else doing something interesting.